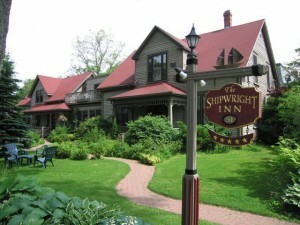 Just a pleasant summer stroll away from the Charlottetown harbour front is the Shipwright Inn, a lovingly restored home originally built by shipbuilder James Phillips Douse in 1865. The quiet, treed neighbourhood and utterly charming architecture of the Inn creates a feeling of being tucked away despite staying in the city. Innkeepers Judy and Trevor welcome you with a wonderful warmth and make it clear that you will enjoy first-class hospitality. Judy is a vibrant, energetic hostess whose cheer is infectious and who makes you feel immediately well-cared for. Despite the enveloping friendliness of your first moments at the Inn, you will not find the service at all intrusive. Your will feel treated as honoured guests with your privacy respected, and all of your needs met. Upon your first glance around the interior of the Inn, it will become clear that your hosts enjoy the home that they have worked hard to outfit with modern comforts, subtly incorporated to maintain the building’s heritage feel, and gracious touches of old world charm. Intriguing antiques grace the lobby, dining area and guest rooms. Little touches throughout your room and throughout the entire Inn – extra blankets here, fresh lemonade and home baked goodies for afternoon tea there – make you feel that every detail has been thought of, and then some. We greatly appreciated our hosts’ friendly, welcoming nature as well as their knowledge of the neighbourhood and excellent dining and day trip suggestions. Our accommodations were on the second floor of the Inn. The Officer’s Wardroom, is a spacious suite with a large lounging area, a very comfortable bedroom with a private deck, and generous master bathroom complete with luxurious air tub. The décor theme had an intriguing Eastern flair, with Japanese furnishings, lamps and collectibles. 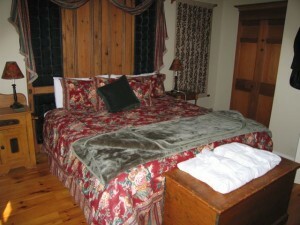 The room’s signature antique piece was the king bed’s headboard, made from the home’s original doors, a testimony to Judy and Trevor’s efforts to preserve the building’s unique heritage. 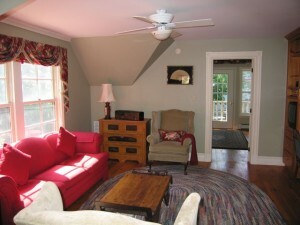 Our suite also had a fridge and kitchenette area well stocked with coffee, tea and hot chocolate. We were impressed by the very spacious closet, which was virtually a room itself. All around, the accommodations were unique, generous and very comfortable, kept spotlessly clean and thoughtfully stocked by the Inn staff. It was a wonderful place to spend a few nights, and we would have gladly stayed longer – maybe next time! Being a bed and breakfast, we also enjoyed a wonderful breakfast menu each morning, including delicious fare such as Belgian waffles, eggs and ham, fresh baked muffins with lovely local jams always on the table, fresh juice, good coffee, and of course, friendly, attentive service. A scrumptious and relaxing way to begin the day! The Shipwright Inn is in a quiet, safe neighbourhood within walking distance of Charlottetown’s major attractions, such as the harbour front, boardwalk, Victoria Park, the Arts center, shopping, and a myriad of wonderful restaurants. We highly recommend it if you plan to stay in Charlottetown. We give the Shipwright Inn 4 and 1/2 Stars- Outstanding!